My name is Gerrit Ritmeester. I am from Holland and am 54 years young. Since April this year I have been working for MSF, on my first assignment with the organisation. Before my MSF life, I had a nice, long career as a logistics manager, product manager and consultant. Currently I am working at MSF’s Uzbekistan and Tajikistan projects. I am based in Kulob, a city in beautiful Tajikistan. MSF has been working in Tajikistan since 1997. The main focus of this mission is HIV, child health and family treatment. In my role, I am an all-round logistician and I love the work I am doing. I have a very challenging job in a very special context in a beautiful country with beautiful people. Several weeks before World AIDS Day, the project team started preparing a program, working with the Ministry of Health and several schools (more than 748 senior students and 60 children) in Kulob. The idea was to make these events an interesting and fun experience, helping families and children in Kulob understand what HIV/AIDS is and how to prevent and protect against it. The week was also an opportunity to tell people about the work that MSF does in this beautiful city. Doctor Fareed, Midwife Elisa and Mental Health Officer Nina made plans with their very motivated staff to make these events a success. School directors were also asked to provide advice about the programme so they could help involve their students as much as possible. The MSF logistical and supply department was closely involved in helping carry out the plans; a lot of things had to be arranged to make it a success. Which activities were on the programme? 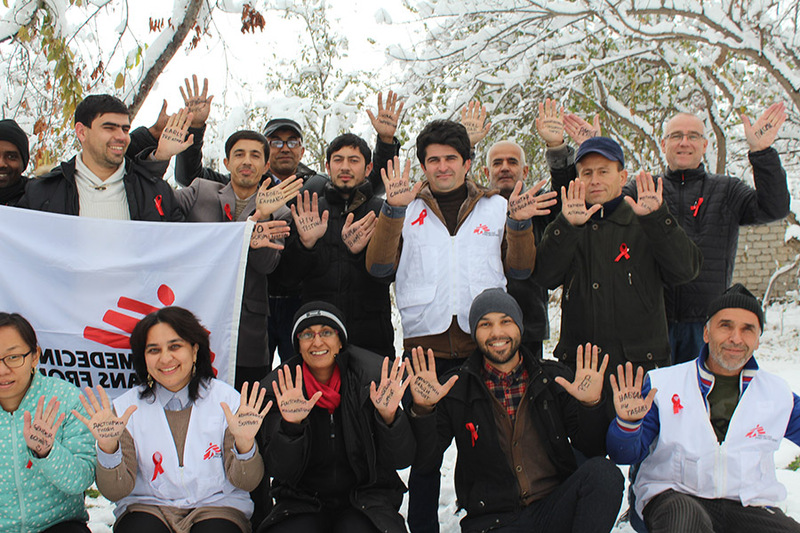 Marking the official start of World AIDS Day events, we had a ceremony to open a new laboratory in the City HIV Hospital, constructed by MSF. The deputy mayor was invited to cut the ribbon for opening the lab together with Manaf, MSF's deputy country director for Tajikistan. With new furniture, tiles and a ventilation system, everyone was impressed with the professional set up of the lab. In the weeks beforehand, we launched an essay competition at five schools in Kulob. 300 students had the chance to win some prizes. Before the handover of the prizes, the national staff performed a health education ‘question and answer’ game about HIV. On the first of December, we hosted an exhibition at the cultural centre, together with the Ministry of Health and some other local HIV organisations. At the exhibition we had a stall and handed out leaflets with information about HIV and mental health, underneath a beautiful banner and next to a video projected on the wall, showing MSF’s ‘Month in Focus’. We also had biscuits and candies. With the treats, banner and videos, we had a lot of visitors interested in our work. As part of the celebrations, a football tournament was organised. Six teams were present, made up of MSF and Ministry of Health staff, and teachers and students, at the Presidential School sports hall. The battles were hard, but fun. There were 300 students from the Presidential school cheering to support their team. The hall almost exploded with the sound, what a noise they can produce :-) ! At the end of the games, all the football players got a gold medal with #1 on it, so everyone was a winner! But for the best three teams we had trophies. The winner was the Regional HIV team, in 2nd place was the American school and our MSF team was proudly awarded 3rd place in the tournament. It was a great success and many of the children said they had never experienced a tournament like it, with such a good atmosphere. After the week of activities, and a month of preparation, we can safely conclude that it was a success. The local media published articles about the events in newspapers and on the web and TV. For me, the response was summed up by a director of one of the hospitals, who told his staff: “hold on very well to what you have, since nowhere else in Tajikistan does an HIV centre enjoy this type of support”.